If You’re Eating Potato Chips There’s A Good Chance The Potato Was Grown In? The Nintendo Character Kirby Is Named After A Real Life? There’s a good chance that when you think of potatoes you think of Idaho (and rightly so as the state grows over 14 billion pounds of potatoes per year). There’s also a good chance that you don’t think of Michigan (a state better known for its distinctive mitten-like-shape and its enormous freshwater Great Lakes). However, Michigan does have a significant potato industry (they’re ranked 8th in the United States and produce over 1.6 billion pounds per year) and, more importantly, most of the Michigan potato crop is devoted to what the industry calls “processing potatoes”. Processing potatoes are potatoes destined to be turned into something else instead of simply bagged and sold for people to take home to slice, dice, and otherwise prepare on their own. Of all those millions upon millions of potatoes used expressly for potato chip processing, a whopping 70% are grown in Michigan. The relationship between potatoes and Michigan isn’t a recent development either. 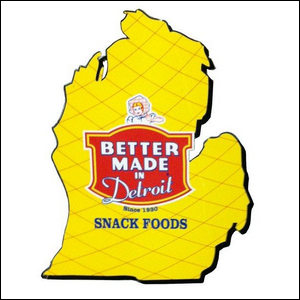 The well-known Better Made Potato Chips company, for example, has operated out of Detroit since the 1930s (and continues to do so) and at the time the company was started it was only one of 31 potato chip companies operating out of the city. So whether you’re sitting at a summer BBQ in Detroit, Michigan, shopping for a Super Bowl party in Austin, Texas, or picking up a snack at a gas station in Fresno, California, there’s a very good chance that your potato chips started life somewhere in the farm country of Michigan. Image courtesy of Better Made Potato Chips Inc.